As a result of two USG initiatives, on-campus residents will now have unlimited access to laundry facilities and menstrual hygiene products. The latter will be made available to the entire Stony Brook University community every day, for free, for the first time. The menstrual hygiene products will be available at the Walter J. Hawrys Campus Recreation Center during operating hours, and once a week at the Student Activities Center during Campus Life Time. Zubair and Party Next Door, the political party formed during the spring 2017 USG elections, made the promise of free menstrual hygiene products their most prominent platform point. The free laundry policy was a major campaign promise of Zubair’s predecessor, Cole Lee, who served two terms as USG president from 2015-2017 and graduated this spring. Lee could not be reached for comment. Instead of filling up Wolfie Wallet in order to do loads of laundry for $1.75 each time, students are now able to do laundry as frequently as they please. The new program is funded by student tuition bills, under the Campus housing fee. Housing across all quads and room styles increased in price an average of $95 from 2016-17. The lack of free menstrual hygiene products on campus has been a source of contention for years, and the recently implemented policy has been in talks since last winter. In January, junior biochemistry major Monica MacDonald started a petition to encourage Stony Brook officials to implement the policy. She sent the petition to Interim Associate Dean of Students Jeffrey Barnett, who passed it along to Kathleen Valerio, the administrative advisor for the Student Health Advisory Committee. Independently, Zachary Shaps, former president pro-tempore of the USG Senate, started developing his own initiative to bring free menstrual hygiene products to campus last year. On Nov. 18, 2016, he traveled to Fordham University with Stony Brook’s Speech and Debate Society and entered a discussion over the taxation of menstrual hygiene products. “I came back, and I was like ‘Wow, It’s ridiculous that we’re taxing these menstrual hygiene products [which are] a necessity for those who menstruate’,” Shaps said. Then, he realized these products that are a necessity were not being provided to students at Stony Brook outside of retail shops, unlike other essentials like toilet paper and condoms. Over the winter break, Shaps changed his USG Senate project from one focused on cutting USG’s carbon footprint and waste, to one advocating for the introduction of free menstrual hygiene products. Together, the pair found funding for a once-a-week pilot program where USG would give out free tampons and pads in the SAC during Campus Life Time. The success of the pilot program allowed the initiative to advance to the next stage. Valerio, Zubair and Director of Campus Recreation Jay Souza met in June to finalize the program as it currently stands. Souza offered Campus Recreation funds to purchase the products, Zubair said. Souza and Valerio could not be reached for comment. “Our ultimate goal, which we have not reached yet… is to allow for these products to be available in restrooms around campus,” Zubair said. The next step is to put tampons and pads in the Campus Recreation Center’s gender-neutral bathrooms and then expand to other locations on campus. MacDonald said she is happy with the progress, but thinks menstrual hygiene products should be available in all residence halls. Still, Zubair is proud that USG can get the program off the ground by the first day of the fall semester. “This is an amazing program that’s going to benefit student health and wellness and inclusion on campus,” he said. Inclusion was on Zubair’s mind as he and others worked to implement the idea. They transitioned from using the term “feminine hygiene products” to “menstrual hygiene products” out of respect for the gender non-conforming members of the campus community who menstruate. Additionally, Zubair wanted to make sure that both menstrual pads and tampons be available, for individual preference, but also for cultural deference. Tampon usage is uncommon in most of the world outside of the United States and Europe for a variety of reasons, including societal stigma and personal safety. 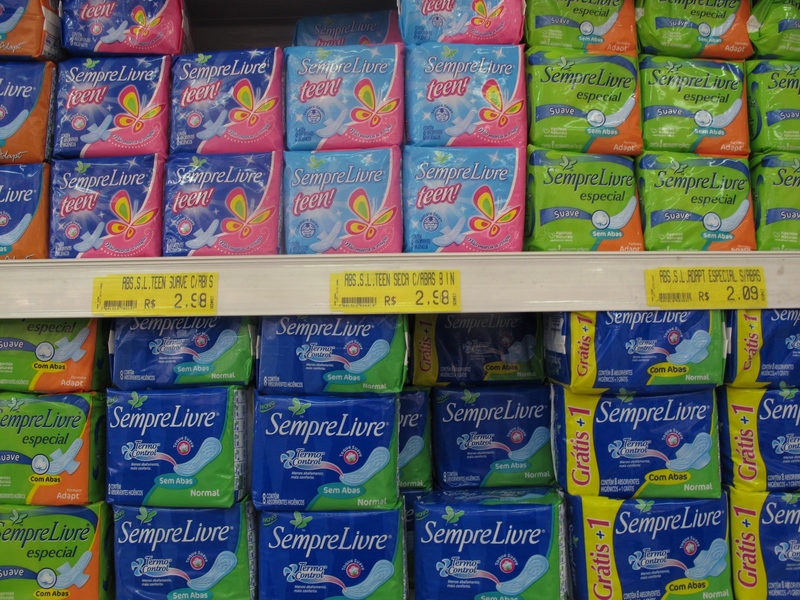 For example, only 2 percent of menstruating persons in China use tampons. One estimate claims less than 1 percent of the 1.7 billion menstruating persons in the world use tampons.